If you haven’t heard, there is a name for all the stalking that I do, “Influencer Marketing”. Basically this is when you find someone that you could contact who could help move your business along in good direction if you could just get them to notice you! 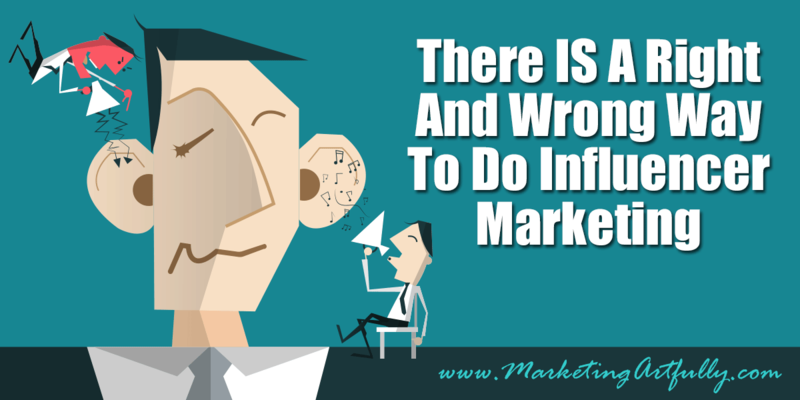 It is the exact opposite doing authority marketing where YOU want to be the interesting one. Instead it is about looking up to the people who are where you want to be. I really think that Dorie Clark must read my mind…:) I needed a good reference for this and BAM she has a video that works perfectly! So yeah, you may get the concept but what does that look like in real life? I happened to get two messages almost simultaneously the other day that showed the right and wrong ways to do this! The first was from some random guy on my Facebook. He did not even bother to try and butter me up at all, he just jumped into the pitch. And I am not sure what that “remind you” thing was. I have never seen his product nor am I an active Realtor. That said I am connected to a lot of Realtors because they are one of my sales silos so I do tend to get this kind of thing frequently! 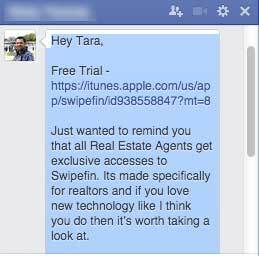 Just wanted to remind you that all Real Estate Agents get exclusive accesses to (his software). Its made specifically for realtors and if you love new technology like I think you do then it’s worth taking a look at. Wow was that amazingly invasive and not helpful. I will NOT be checking out his software and will NOT be sharing any of his links. Now, that was not the worst I get. Many times people will email me wanting to post a guest post on my blog and saying how it will help their business. Really, just like that. They say that using my years of hard work, building an audience and writing my little heart out to promote their work and give them a backlink would be a great idea. Definitely not the way to go. At the same time I got an email in my inbox from Mark. He was nice and seemed really helpful! Which I though you might want to fix it looks like you just have some miscellaneous characters after the .com easy fix. 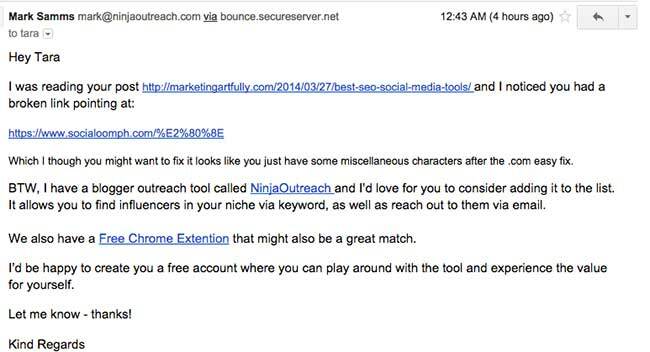 BTW, I have a blogger outreach tool called NinjaOutreach and I’d love for you to consider adding it to the list. It allows you to find influencers in your niche via keyword, as well as reach out to them via email. We also have a Free Chrome Extention that might also be a great match. I’d be happy to create you a free account where you can play around with the tool and experience the value for yourself. Let me know – thanks! Now Mark may have been cheating a little because it seem like Influencer Marketing IS his business, but I LOVE when someone drinks their own koolaid! I don’t really know anything about the software or how it works, but as a lead generating tactic it seems like it was successful. I noticed Mark, have good feelings about his and wrote about him in this post! I believe in karma and that if I do good in the world it will come back to me. Like the loaves and the fishes! One last thing… While I believe whole heartedly that influencer marketing is the shizzy-wig, it will not revolutionize your business overnight. Getting one tweet, post or mention from a “celebrity” will not change your business. It might get you noticed, it might get you an opportunity that you didn’t have before, but it will probably not change your life in any measurable way. I have an influencer who I love and who will remain nameless (Chris Brogan). I think I have mentioned him about 10 times on this site over the years and I thrilled to say that we are friend-ish now! Bah ha…the stalking worked! That said, when he tweets out to his 300,000 followers or mentions me in an email, there is a tick up for sure, but it really doesn’t move the needle on my Authority. My Authority is gained with my hard work and dedication to providing great products and services to my tribe. The best way to approach someone in demand is to not approach them! In general, this feels like a shortcut, but it’s not. The opportunity is to create your own sphere of influence, curate your own content, lead your own tribe… it might take longer, but it doesn’t put you at the mercy of the delete key. At the time I was trying to squish my somewhat eclectic writing style into something that one of the big sites would greenlight so I could get some reflected glory. It didn’t work out, but I did get an awesome quote and figured out that Seth was actually right. Yes, it is good to help share influencer’s “stuff”. Yes, it is good to aim high. But at the end of the day, growing your own empire is the best. Previous Post: « So You Want To Sell To Real Estate Agents…Get In Line!